Last stage of my Google Summer of Code 2014 project was to implement mechanism for sending metadata to AcoustID service. Me and my mentor decided, that metadata will be sent automatically in a background. There is no need for user interaction. Data is sent on adding new audio file to a music library, or on a change metadata of existing track. 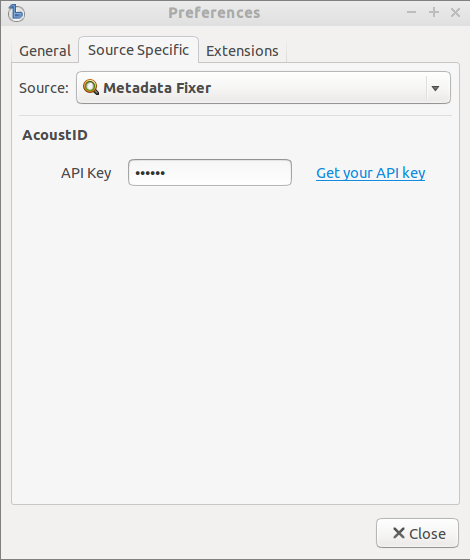 AcoustID requires API key for acceptance new metadata, so user has to enter his key into a preferences window. Key might be obtained on a acoust id website . While user doesn't enter api key, in plugin window, "AcoustID Settings" button will be displayed.